If you ask me, one of the hardest parts about sticking to a healthy diet is all of the planning and preparation it can take. It can be overwhelming at times! In fact, it may surprise you to hear this, but we don’t always eat perfectly in my home. After a busy work day or an evening that we spend taking our kids to the pool, it can be tempting to choose fast convenience foods, whether that means dining out or reaching for a packaged snack. If you reach for convenience foods often enough, it can start to become a habit. That’s when I think a little whole foods “reset” can come in handy. It can be a great way to acclimate your taste buds and get your healthy eating momentum going again. That’s why I created this 5-Day Make-Ahead Weekday Reset program. It’s my new go-to solution when I want to enjoy healthy meals on auto-pilot. 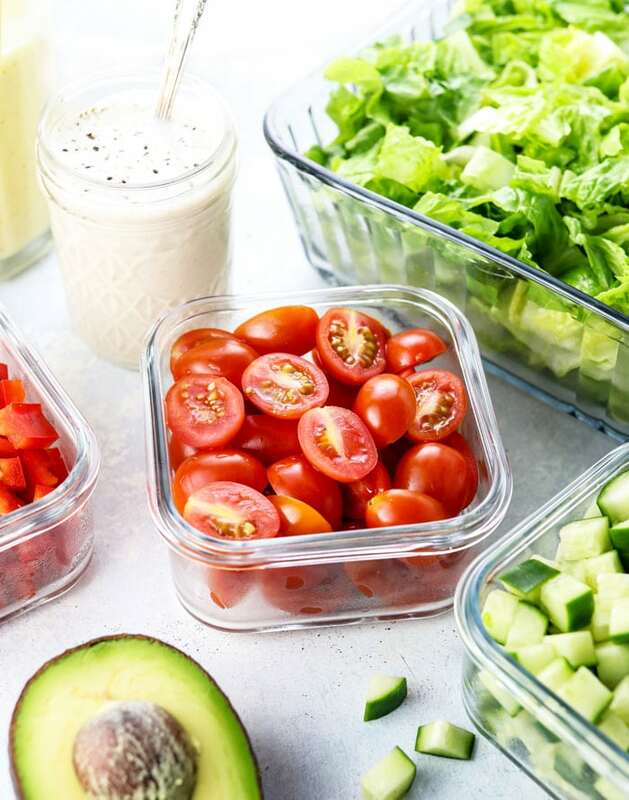 Half the battle when it comes to eating well is simply planning out your meals and preparing a few items ahead of time, so that healthy eating becomes the easiest option available to you. It would seem silly to dine out when a perfectly delicious meal is waiting for you in your fridge, right? For the past several months, I’ve been developing a stash of make-ahead meals that I could prep on Sunday, and then enjoy all week long. For me, the meals I eat during the weekday have to be fast and delicious, because when I’m hungry, I’ll reach for the first thing I see in the fridge. When your fridge is already stocked with healthy meals and snacks, healthy eating is a no-brainer. After testing dozens of recipes, I narrowed down the ones I wanted to eat over and over again, and compiled them into a 5-day meal plan that I could easily follow during the weekday to keep up my healthy eating momentum. I don’t know about you, but I find it easier to make healthy choices during the week when I have a set work/school schedule, and then I like to have a little more flexibility over the weekend, so I can socialize and dine out with friends– without feeling like I’m “slipping up” on some diet plan. The first week I followed this meal plan, I lost 4 pounds in just 5 days. Even after going to several parties over the weekend, where I wound up eating pizza and birthday cake, I still managed to maintain that weight loss, too. In my experience, when you keep yourself consistently nourished, your weight and your mood are less likely to fluctuate up and down, even with some indulgences. What I also love about this 5-day program is that you can repeat it weekly. It gives you flexibility on the weekend and fresh motivation each Monday morning, to help you create healthy habits that last. Really, this is how I aim to eat on a regular basis, but somehow putting the intention out there and having an easy-to-follow plan makes it a little more doable. What started as a side-project quickly turned into a nearly 60-page digital e-book. There’s a photo for every recipe included, along with make-ahead and storage tips, substitution notes, and food combining tips. A few of my favorite recipes in this e-book include the Chocolate Zucchini Shake, Southwestern Salad (a knock-off of the Trader Joe’s salad that I’m obsessed with! ), Chocolate Almond Butter Truffles, Cauliflower Detox Tacos, and Make-Ahead Muesli, which I’m currently eating every single day. Other than physically coming to your house and cooking for you (wish I could! ), I think I’ve done just about everything in my power to make this meal plan as easy as possible for you. Your shopping list is done. You’ll know exactly what you need to chop to assemble the recipes in your meal plan. You’ll know exactly what you’re eating each day. And then you get to eat whatever you want on the weekend– which may very well be more of the recipes in this guide. The choice is yours! You can instantly download a copy of this Make-Ahead Reset program by clicking on the button below. If the button doesn’t appear for you, click here to purchase the e-book for $14.99. *Please note, this is a digital e-book that you can download to your computer. This is not a printed book, so nothing will be physically mailed to you. By purchasing this program, you are agreeing to my terms of service. If you enjoy group support, be sure to join our free Facebook Support Community, where we can all follow along with this guide together. My hope is that, as a community, we can all keep each other feeling motivated and accountable, to feel great heading into Fall! Reader Feedback: Do you meal prep every week? Any favorite recipes that you like to prepare ahead of time? I bought your fist book and now just purchased your second book! I am really wxciyto use it and get myself back on track! 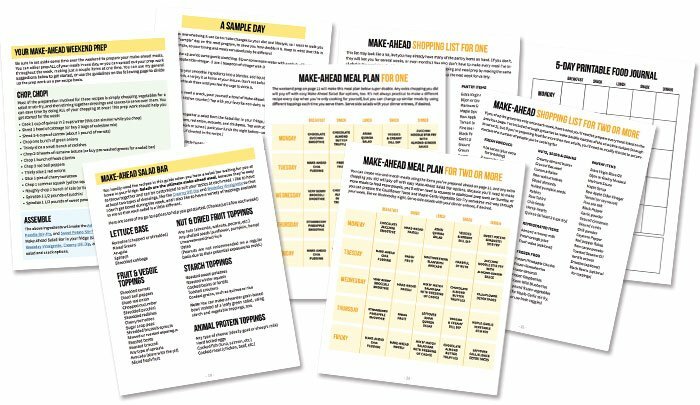 I also just printed out your meal plans and will be using that as a guide as well! Thank you so much for continuing to help people like me! Aw, thanks! I hope you’ll enjoy the books and meal plans! Let me know how it goes!! I am enjoying the make-ahead meals. Is there a Volume 2? Not yet, but I’m working on it! Hi Megan, if I pre-ordered your instant pot cookbook did I read correctly that there is a bonus of the vegan recipes with the pre-order and if so how do I access? Thanks! Hi Jen! There is a preorder bonus coming for the Instant Pot book, but it’s not finished yet! Should be done by this weekend, and then my publisher has to set up the page to let everyone verify their purchase and download it. Hopefully it will be available in the next week or so, and then I’ll make a big announcement to let everyone know! I purchased the e-book and everything looks great. I’m a little confused though because on page 11 you have the chop and prep instructions, but it only makes the Asian Quinoa Salad, Southwestern Salad, Zucchini Noodle Stir-Fry, and Sweet Potato Stir Fry. The next section has make ahead by recipe, then the make ahead salad bar (not included in the first chop section? )and then separate shopping lists for one or two people. If I want to start out with the one person plan, should I buy all of the ingredients in that list and then go back to page 11 and start with chopping for those meals followed by the salad bar? Or are the salad bar ingredients another list? Thank you for putting this together! I want to make sure I order enough to make them all, but not more than I need. Megan, I have both of your cookbooks (love them!!) and bought this plan a while ago but am now only planning to start using it. I have a question regarding the Chocolate zucchini Smoothie that calls for hemp hearts. I live overseas and hemp hearts are not available. What can I substitute instead? Thank you again for your great recipes and for all that you do. The hemp hearts are a mild flavored protein source. You could use a different seed or a spoonful of nut butter, if you like, or just use extra chia seeds. What’s the serving size for the creamy herb dip? I made it and want to use it on my lunch salad tomorrow. Really looking to drop 5lb so I don’t wanna overdue it! I would personally eat about 1/4 cup of the dip with raw veggies or over a salad as a serving. Would the recipes work for the AIP protocol. No nightshades, grains, dairy, fruit. Your download link is not working! Please fix it 🙁 This sounds great! Thanks so much I got it!! Excited to jump in tomorrow. I have not found the creamy Alfredo on Instagram. Hi Megan where did you get and what size are the mason jarsyou use. Hi Megan. I’ve purchased your “Make-ahead weekday reset’ Vol1. And OH MY GOSH! It’s so yummy and healthy. It’s taken all the ‘think work’ around meals out of the equation which is what I needed as I am fighting a chest infection. I was going to do this on my own, but the entire family (hubby, two teen, and my mum) are all on board with this menu! Here is to great eating! Before I order any of your books…did you fix the load button?? And are the recipes Gluten Free? I am interested in the 5 day meal plan PDF book to start. Hi Anne! The download should work perfectly for you and ALL of my recipes are gluten-free, in all of my books and here on the blog. Hope you enjoy the 5-day meal plan! Hi Anne! The recipes in the 5-Day Detox PDF are all vegan, but my cookbooks are not 100% vegan. The first one includes 3 fish recipes and some goat’s milk dairy, and the second book is 100% vegetarian with some lacto-ovo options included. Many of them include notes on how to make them vegan, however. Thank you for your prompt reply. It is the 5 day meal plan that I am going to do once I am finished the 3 day detox. I believe in just about everything I have read here. I’m a few days in and the recipes are great. I’m modifying to add more protein because it seems that, as written, most of these recipes would be really low protein. The first day I was super hungry by mid morning!! Would you be getting enough dietary protein if the recipes were followed as written? Do you have a y other method of payment as I do not use PayPal?! I live in Czech Republic and I can’t check out and pay because the payment site doesn’t accept my mobile number? Any ideas how I can solve this? when you say ‘exclusive’ recipes you mean they don’t appear in either of your recipe books? (I purchased both). Thanks! Yes, exactly. They’re not in my other cookbooks or on the website. Hello. Interested in this book but just wanted to finding out if the recipes are gluten free? So difficult to find good vegan gluten free recipes. Thanks so much! Yes, my recipes are always gluten-free, both on my website and in all of my cookbooks. Hope you’ll enjoy them! Interested in ordering, but wondering if it will fit in my curren Dr. Ordered dietary restrictions. Vegan, but no nuts,seeds,beans or soy. Please advise. Looking at the recipes, it looks like 9 of them would work for you, but the other ones would have to be modified. (Maybe replacing oats or quinoa for some of the seed-based porridges?) If you want to join in, we can always offer suggestions in the support community on Facebook. This looks great! Do the recipes contain gluten? I need to eat gluten-free, but I am very interested in purchasing this e-book! All of my recipes are gluten-free. 🙂 Hope you enjoy it! Hi Megan! I just purchased your 5 day reset and I’m super excited to start. I have a question. Will it mess up the plan if I have 1 cup of coffee with a splash of Almond milk in the morning?I know you said no caffeine, but Ilove that one cup in the morning! I think enjoying 1 cup of coffee is still fine, especially during your first week of doing the reset. You might want to try challenging yourself to give it up in the future (maybe in your second or third round? ), but if it makes you happy, I think this reset will still be effective with a small amount of caffeine. this looks great, think I’m going to get it. I’d love to know, where did you get the glass containers pictured holding the chopped lettuce and spiralized veg? i love them. Yes, he did, but he did have some modifications– I added chicken to many of his salads, and he wanted his cauliflower taco filling in a “real” taco shell. His favorites were the Asian Quinoa Salad and Maple-Ginger Stir Fry, so I’d let him have those as leftovers the next day, while I’d eat one of the other salads. Are some Of these recipes packaBle for lunches? Or stuff for quick prep at home? Thanks! Thanks for the e-book Megan! I’m happy to support you and your endeavors…you give so much energy & excellent eating options. Thanks, Penny. I hope you enjoy it!! Purchased! I’m reading through this now and it’s so great! Amazing Job Megan!! What an amazing Ebook! STARTING on Monday. Really looking forward to trying all the recipes! Thank you – it’s amazing that you are able to put this together having two young children – truly inspiring! Thanks, Nathalie! I hope you enjoy the recipes next week! I have a nut allergy. Will the receipes work for me? Thanks so much. Looking fotward to it. What should we be eating after the 5-day reset? thank you. In the program I discuss how you can incorporate more of the foods you eliminated after the reset is over (if you want to) or how you can repeat the program every week. Personally, I’m trying to use this 5-day program as a guideline for my weekdays, and then I eat whatever I want to on the weekends. My son has LOTS of birthday parties to go to, so it’s nice to keep my options open. This is so true of real life these days! I love the idea of starting this as my kids go back to school….seems like the perfect time to get back in a good routine. I appreciate your work to bring us these programs….it truly helps. I’m gluten free. Are most of the recipes GF? All of my recipes (on the website and in my books) are gluten-free! JUST CURIOUS — wHAT KIND OF KITCHEN EQUIPMENT IS REQUIRED FOR THIS MEAL PLAN? I recommend that you have a blender and a food processor. (Only one recipe calls for a food processor, but it can also come in handy for shredding vegetables for salads!) You may also want to have a spiralizer to make veggie “noodles” but you can make noodles using just a regular vegetable peeler, if you prefer, or you can skip the noodle shape and just chop or shred them for an alternative. Is paypal the only option for payment? Yes, I’m afraid I’m not tech-savvy enough to offer another option right now! I have purchased both of your books, plus another that you suggested from a friend of yours. 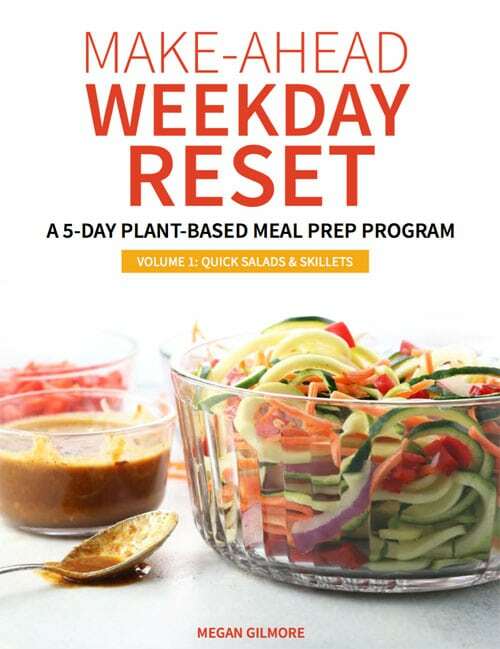 Are all of the recipes in the 5 day reset in your books. I would love to purchase this 5 day reset, but on a teacher salary my income is limited. i have had success with your detox meals, but over the summer i have eaten horribly and have struggled getting back in the habit of eating healthy. i was excited about this 5 day reset, but not really wanting to purchase recipes that i may already have in your cookbooks. Hi Crystal! I can totally relate with the summer struggle, which is why I decided to create this 5-day reset in the first place. I always try to make sure my recipes aren’t exact repeats from my cookbooks, so there are definitely different recipes in this reset. Because this program focuses on fast & easy make-ahead meals, there are some simpler ones that you don’t necessarily need a recipe for, like chia pudding, muesli, and my go-to weeknight stir fry, but the standout recipes to me in this particular guide are the Southwestern Salad, Asian Quinoa Salad, Chocolate Almond Butter Truffles, the Creamy Dill Dip, and the make-ahead smoothies, which were harder to make “taste good” than I expected. (Frozen ingredients are super-muted in flavor.) So, you won’t find those on my website or in the other cookbooks.